Technology is important, but it's only one part of the solution. The electronic age in health care has ushered in many opportunities and jumpstarted nearly as many successes. It has also contributed to the growth of one complex challenge that continues to confound industry stakeholders: patient matching. • legacy and historical data dispersed throughout multiple organizations. While biometrics holds promise in addressing the first challenge, Kotyk explains that disparate data is a much greater issue. "Each of those organizations potentially have fragmented views of the patient's identity if they have been registered incorrectly. That dirty data have to be resolved, and this is the problem that health care is facing," he says. Tim Dunlevy, vice president of engineering with PokitDok, points out that large-scale consolidation of hospital systems continues to exacerbate the problem, as inherited EHRs often live in siloed data islands without a standard means of exchanging information. "The lack of interoperability has led to costly IT projects typically mandated by the very same EHR vendors that created the situation in the first place," he says, adding that read-only health information exchange (HIE) implementations make the problem visible but often cannot resolve it. "Add to this situation the extremely low project success rate for HIE implementations, and the state of data sharing is dire. What's needed is a means to share the data within and across hospital systems with the true intent of HIPAA in mind: portability of health records." Value-based care and the need for clean, complete, and interoperable health data have combined to make patient matching considerably more important, says Mark LaRow, CEO of Verato. "It is at this worst possible time that conventional patient matching solutions have reached their mathematical limits," he says. "Their algorithms are only as good as the data they are matching, and more than 30% of demographic data in any patient database is out of date, incorrect, or incomplete. So, organizations are seeing their duplicate rates rising as these conventional algorithms increasingly fail." While the industry has a long way to go, Dan Cidon, chief technology officer at NextGate, notes that progress has been made in recent years. He says the industry is seeing wider areas coming together to establish a single patient identifier. "I don't think in the United States we'll ever get to a national-scale identifier, but certainly we have seen a lot of successful initiatives on a regional scale," Cidon says. "There is still a lot more that can be done to improve the rates of matching and reduce the cost of ownership. It's not by any stretch a done deal." The Ponemon Institute's 2016 National Patient Misidentification Report revealed that 86% of the 503 stakeholders interviewed had witnessed an error that was the result of patient misidentification. Additionally, respondents said that 35% of all denied claims result directly from inaccurate patient identification or inaccurate/incomplete patient information, costing the average health care facility $1.2 million annually. Yet Kotyk suggests that many hospitals and health systems do not recognize the scope of the problem. While a 10% median rate of duplicate records is an anecdotally accepted statistic across the industry, he explains that Argo research reveals a much higher incidence. In a recent analysis of more than 150 million patient records sourced from clients, Argo identified an average 25% undetected duplicate rate within HIE enterprise master patient index (EMPI) systems and an average 18% unresolved duplicate rate within provider EMPI systems. Cidon points to similar findings. "When we enter projects, most of the people managing the data that need to be matched are shocked at the scope of the problem," he says. "When we put the numbers in front of them … generally speaking, the number we come up with is much higher. The challenge is that the organizations just don't have the tools to figure this out." 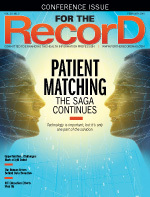 While many organizations are blindsided by the size of their patient matching problem, LaRow says that most are aware that a problem exists because duplicate records have notable negative downstream impact, including redundant tests and procedures, patient safety and privacy issues, claim denials, increased IT expenditures, and analytics problems. "But critically, organizations often didn't become aware of their patient matching problems until it was too late, and an issue arose in a patient-facing scenario, often leading to an adverse care event," LaRow says. "Until cloud-based referential matching services came along, there was never an answer key that an organization could use to determine its duplicate rate." As a rule, LaRow says Verato finds errors in at least 30% of the demographic data in any master patient index (MPI) or EHR. "This is a huge problem because conventional patient matching algorithms are only as accurate as the data they are matching," he points out. Industry professionals agree that technology is critical to solving the problem of duplicate records, although they stress it's not a silver bullet. The industry has made progress on the technology front in that health care organizations now understand what an MPI is and why they need it. The ongoing issue, according to Cidon, rests with integration. "Integration and interoperability in health care is still kind of abysmal," he says. "We have advanced a lot through point-to-point connections between solutions, but there is still much more technology that could be brought in to improve it." In that vein, Dunlevy says many organizations have established interoperability groups that work with their existing EHR vendors to contract additional long-term projects. These projects are aimed at extracting data and utilizing information exchange standards to attempt to make the data available. "However, these systems are often highly customized due to the mix of varying technology inherited by the larger hospital systems and the lack of standards support by the EHR vendors," Dunlevy says. Kotyk agrees that health care organizations are applying rudimentary, unsophisticated approaches to identifying bad records. "That's where we are falling short—analyzing the scope and magnitude of the problem. Once you identify the problem, there is a straightforward approach on how to solve it," he says. Ultimately, strategies must start with the right technological framework, Dunlevy says, although many EHR vendors and hospital systems are reluctant to proceed without yet another large-scale IT project that may not change the root cause of the issue: data ownership and portability. In fact, he says manual approaches to duplicate records management are still common when it comes to identifying duplicates that an existing patient matching solution can't resolve. "Given a consistent and scalable technology where the basics of identity are utilized across a distributed system with inherent encrypted data and access controls owned by the true data owner—the patient—the problem goes away, and hospitals can focus on patient care and not technology," Dunlevy says. According to LaRow, most organizations use an MPI that is either built into their EMR platform or that they have purchased from a vendor. MPIs match patient records using deterministic, probabilistic, or referential matching algorithms. To better understand the scope of the problem, many organizations will also augment their existing MPI technology with a referential matching service—which acts as an answer key—to discover missed duplicates and to resolve the toughest matches the MPI's algorithms can't make. Dunlevy notes that the use of referential matching solutions is more commonplace in HIEs. "[However], providers and payers will soon catch up to this technology trend," he says. When designing a patient matching strategy, Cidon says health care organization should not place too much confidence in technology. "The optimal solution is always a combination of technology, processes, and people. You have to have processes to effectively manage the data in the MPI, and you have to have the right people in place," he emphasizes. "There is always going to be a need for records administration. The MPI helps them do a lot more than they have done in the past, but that function doesn't go away." Cidon adds that there is still an education gap, and the industry must get the message out that this is a complex integration problem. "You are going to have to get people who are responsible for data governance and system integration involved to really make [patient matching] a reality," he explains. "Technology is going to dramatically improve your situation, but it's not going to be the end-all." After nearly two years of work, the College of Healthcare Information Management Executives (CHIME) suspended its $1 million National Patient ID Challenge in November. The challenge was initiated in January 2016 as a private-sector initiative to develop a solution that would "ensure accuracy of every patient's health info to reduce preventable medical errors and eliminate unnecessary hospital costs." In a CHIME-issued press release, President and CEO Russell Branzell said, "We firmly believe that accurate patient identification is fundamental to patient care today and that innovation will lead to better, more affordable, more accessible and more equitable care. Though we've made great progress and moved the industry forward in many ways through the Challenge, we ultimately did not achieve the results we sought to this complex problem. We decided the best course for addressing this patient safety hazard is to redirect our attention and resources to another strategy." Intimately connected to the complexities of patient matching, the vendor community was not surprised. "We as an organization looked at it and asked ourselves, 'Do we want to participate?' A couple of things struck us in the beginning to not get involved," says Dan Cidon, chief technology officer at NextGate. "This notion of a 100% match and the premise that through a technology solution you will be able to achieve 100% match—it's great in terms of optimism, but it does not reflect reality. That put our sensors up: 'Whoever is conducting this challenge, do they really understand the space?'" Steve Kotyk, director of health care business development at Argo Data Resource Corporation, says CHIME was misguided in its attempt to solve a complex problem with a single bullet. "How do you get every individual in the United States to accept an identifier?" he asks. "They probably ended up realizing that technologically you may find a way to assign the identifier, but how do you get adoption, how do you scale?" Mark LaRow, CEO of Verato, notes that the CHIME challenge proved that biometrics and blockchain are not the end-all solution for the patient matching problem. "It also proved that patient identification is only a small part of a much larger challenge around patient matching—no patient identification solution, no matter how sophisticated, will be able to resolve the billions of duplicate records currently in existence," he says. "Algorithms are the right approach to the patient matching problem, and referential matching algorithms are the next-generation solution to this problem." CHIME commended those who participated in the challenge and said it will assist in developing a Patient Identification Task Force through its CHIME Healthcare Innovation Trust, the CHIME affiliate that sponsored the challenge. "We will continue to lead, but we cannot do this alone," Branzell said, noting that Washington has signaled a possible easing of restrictions on supporting a national patient identification solution. But these actions are not sufficient to meet CHIME's goals. "We need industry and government to join us with the same level of passion and commitment our members show in their positions as CIOs and senior health IT executives," Branzell said.